We offer a variety of art and crafts, providing all the materials for the session. Our practitioners vary in their approach and choice of media, from paints to inks and modelling clay. Using iPads to create art is another popular option. In addition to providing single sessions, we can arrange a series of sessions so that residents can collaborate under the guidance of our artist to create an extended piece of work. For example, residents of the Leonard Cheshire home in Shanklin collaborated with Independent Arts practitioner Leigh Jackman to produce a stunning artwork for their dining room (below). 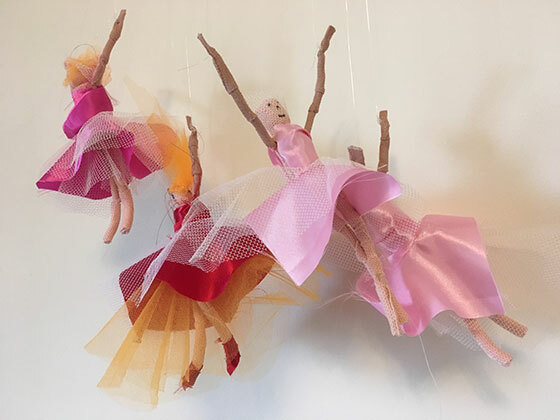 These ballerinas were made by residents at Cornelia Manor and were part of a series of StoryBox workshops themed around Stravinsky’s ballet, The Firebird. Residents really loved the story and the musical score too. They staged a little performance with the puppets for all the residents on Wednesday 13th March 2019! Photography is a great option, as it is accessible to most participants and the finished product is immediate. Independent Arts has a supply of digital cameras for use in these sessions. Printing costs are included in the session price, as is the expertise of our photography practitioner. There are many possibilities for photographic work within residential settings: participants may choose to exhibit their work at an open day, or keep their photographs privately to create a photo-diary. We can provide a project plan running over several sessions, or deliver photography in one session, so the work can be shaped around your requirements. "Clearing-up time always comes too soon."